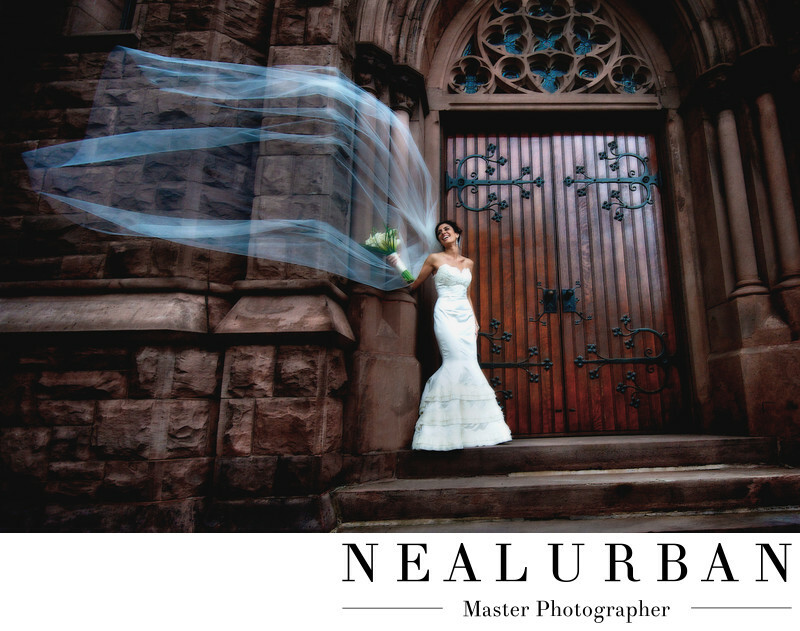 This was an epic weather wedding for Neal Urban Studio. This wedding truly defined Neal's creativity and artistic eye. Jaclyn and Tim had a beautiful ceremony at St. Louis RC. Church in downtown Buffalo. The reception was at Pearl St. Brewery and Grill. The weather for the day was not looking too good. The tail ends of Hurricane Earl were said to be hitting the area that day. For once the weathermen were correct! It was so windy after the ceremony. The bride and groom really wanted to go to the Erie Basin Marina for photos. We were very hesitant at first and asked if they were sure. But first, we wanted to do some photos outside of the church. It is a beautiful church. We love the doors. Jaclyn had a cathedral length veil. We didn't know at the time, these would be key accessories we like to work with! We had Jaclyn stand in the doorway. The wind was so strong, we had to move her to the side so she could lean. She was being pushed around like crazy. We pulled her veil from behind her, so it wasn't bunched in the back. Her veil took off in the wind like a kite. Luckily her head was against the stone, so it stayed attached to her hair! The bride started laughing hysterically. At this point, it looked amazing on our end! We had her lift her flowers slightly. Neal turned his camera to burst mode. He was snapping away like crazy because the veil was everywhere. This series had at least fifty images. After grabbing this image, we showed it to the bride and groom. We said if they were still up for the waterfront, let's go. After getting this image, we were so confident we would do something amazing! We sure did! The image at the waterfront, put Neal Urban on the Map! He won a WPPI (Wedding Portrait and Photographers International) award for this. It was featured in multiple photography books, and Cosmopolitan Bride! We love a challenge. We live in Buffalo and the weather is always changing and unpredictable. We have to take it as it comes and get creative! Location: 35 Edward St. Buffalo, NY 14202 United States.